This copper engraving from approximately 1700 depicts the condition of the English prisoners at the hands of the Dutch. In the 1660s, Cornell University's Eric Tagliacozzo says, the conflict and competition for the spice trade came to a head. "The Dutch decapitated a number of English merchants who were also in the Spice Islands trying to profit from the trade." Ah, nutmeg! Whether it&apos;s sprinkled on eggnog, baked into spice cake or blended into a latte, this pungent spice can evoke memories of holidays past. But a lot of blood has been shed over this little brown seed. 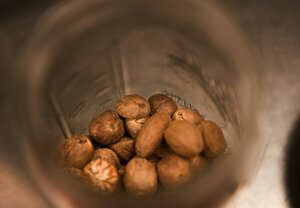 "Nutmeg has been one of the saddest stories of history," says culinary historian Michael Krondl. If you listen to my story you&apos;ll hear the gruesome, grisly tale of how the Dutch tortured and massacred the people of the nutmeg-producing Banda Islands in Indonesia in an attempt to monopolize the nutmeg trade. So, why was nutmeg so valuable? Well, Krondl likens it to the iPhone of the 1600s. It was fashionable among the wealthy. It was exotic and potent enough to induce hallucinations — or at least a nutmeg bender, as detailed in this account from The Atlantic. Nutmeg was considered medicinal, according this 16th century description: "Nutmegs be good for them the which have cold in their head, and doth comfort the sight and brain, & the mouth of the stomach & is good for the spleen." "Nutmeg really does have chemical constituents that make you feel good," explains culinary historian Kathleen Wall of the Plimoth Plantation. And traditionally, we turn to nutmeg (along with cloves and cinnamon) this time of year because these spices — as the settlers to the colonies believed — can help warm us up and even help us fight off head colds and stomachaches. And for foodies, nutmeg is an ideal spice for layering flavor. We visited Chef Kyle Bailey of Birch and Barley restaurant in Washington, D.C., who combined spinach and nutmeg to whip up a divine puree that marries the flavors beautifully. I must also mention a bit of nutmeg history that makes good dinner-party conversation: the question of whether the Dutch traded Manhattan (yes, New York) for nutmeg. In the 1600s, "the Dutch and the British were kind of shadowing each other all over the globe," explains Cornell historian Eric Tagliacozzo. They were competing for territory and control of the spice trade. In 1667, after years of battling, they sat down to hash out a treaty. "Both had something that the other wanted," explains Krondl. The British wanted to hold onto Manhattan, which they&apos;d managed to gain control of a few years earlier. And the Dutch wanted the last nutmeg-producing island that the British controlled, as well as territory in South America that produced sugar. "So they [the Dutch] traded Manhattan, which wasn&apos;t so important in those days, to get nutmeg and sugar." And back then, the Dutch considered it a sweet deal! A version of this story was first published Nov. 26, 2012.